The parallelisms between the boom-and-bust of the 1920s/30s and our current economic and political meltdown are ubiquitous and uncanny (eg, here and here). 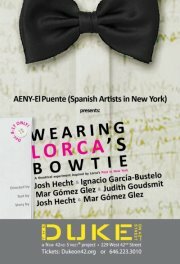 These unsettling coincidences form the knot of “Wearing Lorca’s Bowtie,” a wonderful production that will run at the Duke Theater on 42nd Street until December 17, 2011. The great Spanish poet and playwright, Federico García Lorca visited New York between June of 1929 and March of 1930, and was an eye-witness to the Wall Street crash in October of ’29. Lorca’s writings about his time in New York are somewhat schizophrenic. In the difficult and dark book of poems titled Poet in New York, Lorca presents the city as a strange and almost post-apocalyptic landscape, in which the singular, lonely, and out-of-place “poet” of the title comes across like an Old-testament prophet, denouncing the violence and rootlessness of the fallen city. But the letters he sent from New York to his family in Granada are often upbeat and occasionally even bubbly; he speaks of how the city and its people impress him, and of the many friends he is making here. He exaggerates his progress in learning English, in promoting his plays in the US, and in completing 3 new books of poems. Learning English and “making it” in New York seem to have been the main objectives of the parentally-sponsored trip of this 31-year old to New York; a fact that helps explain the obedient, cheerful and optimistic tone of many of the letters. Lorca’s biographers have also established that Lorca came to New York to get away from a series of personal crises. In this piece, Lorca’s moebius strip-like bowtie becomes a kind of talisman, or magical garment. The “pajarita” (a bowtie is a “little bird” in Spanish) is what binds and conflates the two moments (then and now) and the two visions (dark and bright). Like an artistic vocation, like the plight of all those who have left home, Lorca’s bowtie, the play suggests, is both a blessing and a curse for anyone who dares to don it: both an adornment of performed sociability and, at the same time, a noose of creative solitude. “Wearing Lorca’s Bowtie” runs through Saturday, December 17 at the Duke Theater on 42nd Street, 229 West 42nd Street, Manhattan; (646) 223-3010, new42.org.